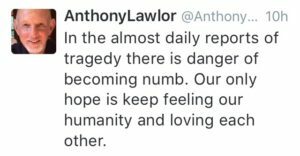 So, so much darkness in the world right now. The tragedies and traumas are coming at us so fast and furiously we hardly have time to process before the next one hits. We barely remember last week’s tragedy. 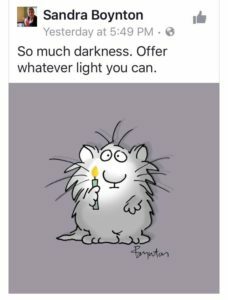 This post by Sandra Boynton resonated with me. There is danger in becoming numb. We need to feel our feelings. It is okay to feel angry, sad, scared or any other emotion that you may be feeling right now. I challenge you to feel your feelings today. Spend some quiet time, alone and away from all screens and just feel whatever it is you need to feel. Then, come back in to the world and offer some light, whatever light you can. Smile at a stranger, pick up garbage on the street, call someone you have not spoken to in awhile, write a handwritten letter of appreciation to someone and mail it, get involved in politics, volunteer, run for office, be the change! What glimmer of light can you offer today? ← Is Twitter Still Magical?